While the 2000s were not a very long time ago, they are as special as every other decade. When the last season of CNN’s The 2000s was shown, it brought back the nostalgia of what we had just gone through. There is also a surge of films that bring back memories of a recent past, such as Lady Bird, which takes place between 2002 and 2003, a Japanese film called Sunny which goes back to the 1990s, and a new film called It’s Boring Here, Pick Me Up, which had its world premiere in the Vancouver International Film Festival this year and releases in Japan this Friday. Based on a book by Mariko Yamauchi, Ryuichi Hiroki has made a film about people going back to their hometown and remembering moments in their lives that they wanted to forget. 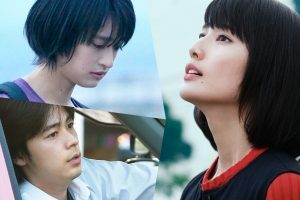 The film begins in 2013 when a woman (Ai Hashimoto) asks a server for the whereabouts of her former classmate, Shiina (Ryo Narita). Next, she sees her best friend and they go on a tour of her hometown, which she was very bored of when she lived there prior to moving to Tokyo. They go to an arcade where they used to hang out a lot. There she sees a former boyfriend (Mugi Kadowaki) still playing his favourite game and all of them reminisce about their past. The film goes through a loop of flashbacks between 2004 and 2010 to show why some of the characters regret what they did during that time before going back to the present. The characters also encounter other people that they know, such as Shiina’s sister. There are a lot of scenes that were shot in one take to make it feel like you are with the characters. The flashback scenes are very nostalgic, showing Japan in the 2000s paired with a soundtrack comprised of songs from that decade. The film even plays a song by Saboten (a very popular band in that decade) in one scene—a track which was their biggest song in 2004. During the world premiere of It’s Boring Here, Pick Me Up in the VIFF, Hiroki and Hashimoto introduced the film and did a Q&A after the screening. This was Hashimoto’s first time visiting Vancouver. I asked Hiroki if there is a surge of nostalgic films, to which he answered that he did not intend to make a film that brought back nostalgia, but to make a film about people going back to their past. He added that his high school years were not fun. Also, I asked Hashimoto if she drew upon any personal experiences when they were filming. She told me that while she did not use her personal experiences, she did draw from her interests, especially during the scenes in the arcade. Like the title of the film, Hashimoto described her character as bored or average because she just goes to her hometown and is not excited about it, compared to the eccentric characters that she’s played in her other films. Going back to your hometown can be full of reminiscing and maybe boring, as shown in It’s Boring Here, Pick Me Up.